Tabatha Bundesen’s cat Tardar Sauce became worldwide famous a few years ago. 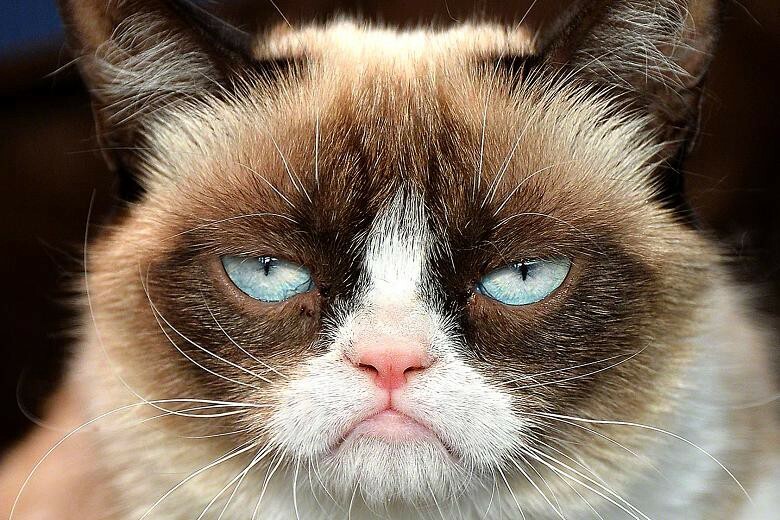 Because the cat had a permanent frown on his face, people started calling him Grumpy Cat. The cat’s fame grew so much that Tabatha even gave up her job as a waitress. She then created a company, Grumpy Cat Limited. And the profits were huge. She sold all sorts of merchandising. From mugs and pens and postcards to pillows, apparel and books. She made millions with her cat. And suddenly she saw that her cat had to be registered as intellectual property. Because the frowning face was everywhere. And then she found out that one company was using the animal’s image without her permission. It was a company from California, named Grenade Beverage. They signed an agreement with Tabatha and decided to name a new line of iced coffe “Gumpy Cat Grumpuccino”. Up to here, everything ok. But Grenade later created a roasted coffee line, also with the cat’s name and face. And this product was not on the deal they reached with Grumpy Cat’s owner. So Grumpy Cat sued them. The cat’s enterprise argued that Grenade was using the cat’s image without persmission on products which were not authorized by Tabatha. Furthermore, they were not receiveing their share of the profits any of those products generated. Grenade Beverages sued the cat, saying that he was supposed to promote the coffe but never did. Now, a jury from California has ruled in favour of the cat. And they have ordered Grenade Beverages Company to pay Tabatha $700,000 because they misused the cat’s identity. The story is all over the press these days. After all, Grumpy Cat’s a star. But, as The Washington Post has put it, still the cat won’t smile. Not even after winning the lawsuit.